Just Another Day...: Please Don't Touch! It's from a website called MyTinyHands and I am SO wishing we had this little sign when we first brought Chase home from the hospital after his surgeries! Granted, the boy was confined in our home "bubble" for the first 6 months of his life, but when we started taking him out, it would've been nice to have a sign like this so we wouldn't have to keep asking people NOT to touch our son. Honestly, people don't seem to realize how germs are transmitted from one person to another. People don't think, "Hey, I've been standing in the foyer, welcoming each and every person who has come in for church for the last 20 minutes by shaking their hands, so maybe I shouldn't touch that little baby with the special heart, or maybe I should wash my hands first..." I hate having to be "that mom" when it comes to this issue, but my baby's health and safety is my NUMBER ONE priority. It definitely isn't easy asking people not to touch Chase, since it's such an accepted practice (for what reason I'll never know -- almost as bad as touching a pregnant woman's belly). I do NOT like to hurt people's feelings, especially when they're just trying to be nice and get a good look at our little miracle boy. But really, what may be a simple cold or irritating flu to heart healthy people, could potentially result in a hospital stay for my son. It's that simple. I didn't intend to write a post about keeping your hands off my baby (unless you're willing to Purell or wash your hands first), but I guess that's what this has turned into. I guess I'll leave you with a few quotes I found on the MyTinyHands website. Maybe after reading these quotes, you'll understand why keeping dirty hands off little babies is so important and should be obvious! "The biggest danger to babies is other people's hands." "Since people who don't know they're sick can also spread germs, it's completely appropriate—and not rude—to make everyone wash their hands before touching [your] baby." "When babies are born, their immune system is not mature, making them susceptible to any germ they come in contact with." "It's not a problem to have close friends and family hold your newborn, as long as they wash their hands first and avoid coughing or sneezing near him." "Washing hands is the simplest, most effective thing you can do to reduce the spread of colds, flu, diarrhea, and sometimes even serious or life-threatening diseases." "Eighty percent of infectious illnesses are spread by touch—by coming into contact with contaminated people or objects." Yep... loved your post. Right there with you! Linked to your BLOG on this one. I don't think your post is out of line at all. You know you could have an annoucement made at church asking people to either keep their distance from Chase, especially during flu/cold season or ask them to wash their hands first. I know last fall & winter the elders at our church made an annoucement asking the members to stay home if they were sick so they wouldn't spread any sick germs. Plus one of our elders had a newborn granddaughter but I was thankful for the annoucement since our little one wasn't well yet. 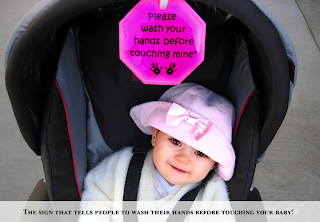 We got one of those signs during Maddie's first year of Synagis from the company- it was in a packet of information on Synagis and it worked great to put on her carseat carrier. Maybe check with your nurse or doctor's office....ours looked exactly like that but was red!